I love this vest! Perfect fit, well made and just plain beautiful. I got compliment after compliment after wearing this vest for the first time. Say yes to this vest. This vest is quite distiguished-looking, warm, nice looking and well made. Unfortunately, it was a good deal larger (by 2 inches at least) than the sizing chart showed. Will have to get it altered to fit properly. Go a size smaller than listed. I was looking for a leather helmet to wear when driving my English sportscar. Wind noise gets bad over 40MPH. This item helps but it has a few problems. The chin strap could be more forward, it is uncomfortable on the throat. Also, one of the ear flaps is coming unstiched. I love this all cotton blouse, it fits perfect and worked quite well with my steampunk Victorian outfits, will be buying another color soon! These are very comfortable and nice fitting pants. There was plenty of hem for a 6ft 2in guy so had to take up several inches but not too difficult to accomplish. Fabric was sturdy and they had a great feel to them. Used for a steampunk outfit but could easily use for other period pieces. Used for a steampunk outfit and worked well. Could have bought a size smaller but went with the sizing chart for my size. It was nice to having a pair of pants that had the appearance of a skirt for a change. Shirt is very nice and exactly what I expected. This would be ok to use as a prop but is not functional. Very blury and you can't see out of it. Also it smelled bad when it arrived, probably a die that was used on the leather, needs time to air out. Very nice in both design and quality. Just what I was looking for. I absolutely love this coat. It goes great with either pants or a skirt, although it obscures any bustles. I wore this to a steampunk convention and got complements on it all weekend. It does run small. Refer to the sizing chart, then order up a size. Items I wanted were out of stock, but the customer service staff was able to tell me what items were scheduled to be stocked and when, and place them on backorder for me. Items arrived in time for my con. Thanks! I turned many heads when I wore this beautiful hat. The craftmanship is stunning and of high quality. I am quite pleased with my purchase, and I highly recommend this product. Ordered the vest kind of last-minute for my Husband to wear for our wedding. It arrived sooner than expected and fits pretty well. It could be taken in a bit at the shoulders, but otherwise great! Happy to find it in his size! Perfect pants for a regency outfit. They come very baggy, so they definitely need to be altered. My tailor took in the waist, legs, and hemmed them for $15. It fits really well, maybe only the arms a tad long. Perfect for a Mr. Darcy outfit, even if it's not 100% period. Real sharp vest, no complaints. I'm a size 9 and ordered a small (sizes 8-9), they were still big on me. I had to wear two pairs of thick socks. I wore them for two nights, walked all over NYC, and they were very comfortable. They definitely have a costume look to them, but the only other option was to spend $250 which didn't really make sense if I'm only going to wear them a couple nights a year. They work well for a Mr. Darcy look. I am most pleased with my Homburg. Ordering was easy, shipping was swift, and customer service is very kind, and helpful. Thank you so much! The vest arrived as promised and was exactly as expected. I had read an earlier review for this vest before purchasing so I did expect the color to be a little darker than the photo. Sizing was accurate and it worked for my occasion. I was absolutely thrilled to stumble onto your site. The selection is amazing. The quality of material in the shirt is great, the cut however could use a bit of help. The Large is really big in the body, small in the neck and the arms could be just a bit longer. That said - I hate to take it off. Right out of the box it is soft and comfortable. A light steaming and you are good to go. Shipping was reasonably priced and arrived sooner than expected. I look forward to ordering from you again. Bought these to mount to the Brass goggles…took the black paint off, outfitted with leather…so sweet. In an age were customer service is a thing of the past, you folks continue to reject this paradigm; and thank you for that. Oh sure I look around the web for deals, but whenever possible I purchase from Historical Emporium, period. Nice to know some of the old ideas are still alive. Perfect fit. Great quality. Very pleased. This is the perfect black skirt. I wore it for Halloween butted up with a corset. Also can pair with blazer and wear to work. Great price too. As always the product was as stated, the fit was excellent, and the delivery was fast and efficient, even though it had to come from half way across the world. There are not enough superlatives to describe how happy I am with another fantastic order. No matter what you are doing, be it exploring the depths of a new tomb, or attending a dinner for the Royal Archeological Society, this coat will keep you dpper and cool, no matter the stress of the situation. If you want to make sure your goggles have clear lens then you need these to swap out with. Easy to install. It was just goggles and I had planned for the expected delivery time. Much to my surprise it arrived in half the time, ready for the first party of the Halloween weekend and beyond! They definitely delivered as promised. I received my Fulton, rust colored vest and am quite happy with it. It was a special order, so it took longer than the order I placed previously, but it fits into my vest collection nicely. I like the four pocket feature. It provides a spot for a pocket watch, a cell phone and keys and a pocket for change. I'm definitely sold on the four pockets. I purchased a Classic Canvas Work Vest previously, but this color was not available in that style selection. I wear both vests on a regular basis, usually alternating every day or two. I am very pleased with the service, from the person taking care of the order to the shipment. I will be back in the future. Thanks again for the old fashioned, professional toch in the service deptartment. I was truly impressed with not only the quality of what I ordered, but the swiftness with which it was delivered. I appreciated the professionalism and will remember this company! Thank you very much! Quite satisfied with service provided. Reminded me of the personal, friendly service of a home-town clothing store. I chose to purchase because of a second to none on-line website that showed a wide range of products and price ranges. Service more than met my expectations. Very professional from point of sale thru delivery. I will not hesitate to return in the future for further purchases and would recommend your company to others for satifaction in on-line shopping! However, it IS cut smaller throughout the bust. I am not greatly endowed, but fortunately, I chose to wear this blouse over a corset, which made it work. Although the bust is cut smaller, the rest of the blouse isn't, so if I had ordered a Medium (I ordered a Small) it would have been too big. As basic white blouses go, this one will be my go-to blouse for cooler weather and layering. Great! Exactly what I was looking for to wear for the Holidays. The quality of the garment is exceptional. I LOVE that I can order from this site and get my products within about three days. All of my husband's victorian/Regency costume pieces have been ordered from this site, and I have been recommending it to friends. I also appreciate the sizable selection. Good job! Thanks is make a great unique piece on my desk! Great watch love that it's wind up and never needs a battery. Look amazing , works amazing, couldn't be happier. Everything came fast with no problems. It was all packed well and secure. Can't beat the price and quality combination. Extremely fast shipping was a bonus I wasn't expecting. Very satisfied with this product. Nothing but high praise for this company. Good communication, fast shipping and high quality products. Looks just as good in person as it did online. Fits well too. The metal buttons add a nice touch. I'm very happy with this vest. The holster is beautiful. Very pleased with the quality and craftsmanship. Awesome product my boyfriend loves it!!! The jacket itself is beautiful, but it's too big. I have a 34 inch bust, so I ordered a medium, and I simply don't have the cup size to fill it out. It's not terribly flattering on me, and it's a shame. I'd hate to pay shipping to exchange it for a small only to find out that it doesn't fit right, either. I guess that's the gamble you take when buying clothes online. This jacket was absolutely perfect in every way for me. It fit to a tee and it look great. The quality was superior and well made. Love it! These goggles look great. The fit is adjustable with a leather belt strap, so may be too tight or too lose. The part of the lenses that contact the face are a bit uncomfortable, but all in all, a great product! What a cute necklace! I would recommend to any cephalopod fan! You get what you pay for. It was an inexpensive key chain, so some of the links were loose and needed tightening, and one of the hands was stuck and I could not get it to budge. However, it serves its function well, which is to look pretty hanging from my belt. I do not regret the purchase. It's a little big for my 6 inch wrist, but that's no different than any other standard size bracelet. It's adorable and I love it! I would recommend to any cephalopod fan! This skirt is truly "pencil thin to the knees," so I found it a bit difficult to walk up stairs while wearing it, but that's the price we pay for fashion! Right, ladies? This skirt is sassy and gorgeous, and true to size. I love it! It's cute, but I found the links in the chain needed some tightening. An easy fix. I was exactly in between small and medium, so I ordered the medium. I find it to be a bit too loose for my tastes, but it's passable. The dress itself is very pretty. I some questions about the fit of an item, and the customer representative went into the warehouse and physically checked the idem. They could have just told me what was on their computer, but decided to go the extra mile (hopefully not literally :). I found it to be true to size, although it is a bit short. My tucked in blouse tends to peek out underneath the bodice a bit. I do love the fabric, though! I'm quite pleased with the purchase overall. Cute little key chain of average quality. Links needed tightening, but that's an easy fix. I'm still pleased with the purchase. Links needed tightening and some of the moving parts are difficult to move. It does serve its purpose well, though, which is to look awesome hanging from my belt. I do not regret the purchase. great look fun boots comfortable shoes! I like everything about this vest. It looks good, fits good, and the quality of construction is good. I'd certainly purchase again. The pictures do not do this blouse justice! What a gorgeous, feminine garment! Highly recommend! Outstanding quality! Love your product! I've always had great experiences shopping with steampunk/Historical Emporium. My only gripe is that the items I like always seem to be out of stock! I get that this is a niche market, so they don't want to have too much inventory, but it is a frustration nonetheless. However, the people I've dealt with at the Emporium have always been courteous and professional. I will continue to be a repeat customer of steampunk Emporium...as long as there's inventory for me to buy! Very pleased with everything that I have purchased and the quick delivery! Thank you for providing a wonderful selection in so many categories. Superb design and quality fabric. All the workmanship was excellent, sans a loose button. I restitched all button with a very heavy thread to be sure I don't lose one. Bought this shirt to add some color to a brown --- black wardrobe. Really like the shirt and everyone that has seen it loves it. We do reenactments here in Arizona and attend a lot of western activates and festivals. Really well made and comfortable. I have bought a lot of clothing from here and when I have had to call or E-mail them they have ALWAYS been great. Quick to return your E-mail and they are super friendly on the phone. I will continue to buy from them and I'm very satisfied overall. Thanks Historical Emporium. Perfect. Just as advertised, true to size and pretty well made. Shipped very fast. I'll order again for sure. The cap arrived safely and timely. I liked the looks and construction of the cap. When I tried it on my head, it was too small for me. I had full intentions of returning the cap at that point. My 20 year old son walked by as I was trying on the cap and said, "Cool cap, I want it!" When he tried it on, it fit him perfectly. He and that cap are now inseparable. I have to agree that he looks very sharp on him. Now I am under pressure to finish the 1915 Ford Model T speedster and teach him to drive it. My only hangup with these Gaiters is they weren't from a matching pair. The gaiters are very used which ended up being great, but being from two different previous owners they weren't worn/aged the same. Very cool product and matched my halloween costume great! I purchased this vest with the hope of being able to wear it outside of costuming. I am not disappointed, the fit and finish on the vest is great and assume it will hold up as any garment should. Thanks for great product. I purchased this coat for a Plague Doctor costume that I put together, The coat is a little on the slim side but worked out great for me, I am 6ft 195lbs. I waxed the canvas to give it a stiff and aged look with melted paraffin and beeswax. I really like this coat and can't wait to find another excuse to use it. This cameo is not only good for costumes, but would look good on the right outfit you would wear now. I have had so many compliments on this suit. It was perfect for the play I was in. Your sizes do run small, though. But I love it. I spoke to a lovely woman, who helped me get what I wanted in a short amount of time. Her suggestions were life-saving. This will be where I go if I ever need another product. I purchased this jacket for a Halloween costume and it fit perfectly. I had many compliments on it and look forward to wearing it again! I was notified within hours of making an online purchase that the item I wanted was out of stock in my size. I picked something else and the change was handled almost immediately and shipped right away. Fabulous experience for a first time buyer from this company. Good trousers for any role playing occasion. I was very happy with the purchase. The legs on mine weren't very thick though, leaving a tighter feel than what I'm used too. I'm about 6'4" and 195lbs, athletic build, so if you have really thick legs, you may want to inquire further about this item. Also it's dry clean only. This is my first time purchasing products from The Historical Emporium, and it will NOT be my last . I ordered my derby hat and was very impressed with the product and the shipping time. I would DEFINATELY recommend this site to anyone who is interested in this type of clothing and accessories ! Very nice cap, but was a little too big for me. I used your measuring guide but should have ordered a size smaller (medium). Very nice trousers. Even nicer than I expected, very heavy material, will make great work pants. These pants are very thick and durable, while being stylish and comfortable. The only drawbacks: They refuse to stay ironed when worn, and they fuzz a bit in the wash. Still worth it. A dandy accoutrement for any gent of means. Made for a big skull. Just as described. I am very pleased with everything I have received. the order was correct and shipped in a timely manner. Will always do my historic shopping with Historic Emporium! I knew I wanted the two tone double gun the second I saw the picture. I am extremely happy with the gun belt. Only problem was that I took your sizing advise and the belt was three inches to big. I modified it to fit, then I bought a second revolver to fill it. I immediately found exactly what I was looking for. My gun belt was even better than I expected. Service was excellent. I will purchase from you in the future and will definitely recommend you to others. it would be great if I had some sort of instruction on how to tie this since I am new to this type of dress. Covered in a peel-off protective film. Buttons are nice quality, feel like metal. Not cheap plastic buttons. I liked everything except one button was attached out of alignment so I had to cut and re-sew it. More brown than black. Nice item though! Just what I was looking for, the cloth could be a bit heavier for my liking, but that's a minor quibble. Nice hat, good color, well made. Well worth the price, quick shipping and excellent customer service. I would have given it 5 stars, but I wear a 7 5/8 fitted and the XL is a little too tight, although not enough for me to go through the hassle of making a return. Great customer service, bar none. I was looking all over for a pair of long black lace gloves and these fit my vision perfectly! In person they look amazing and are excellent quality, Thank You. Having grown up watching the television western series of Bat Masterson (starring Gene Berry), I always wanted a walking stick like his. Seeing the one western Emporium offered, I was intrigued with its faux ivory grip with silver accents. Upon ordering it, I often reviewed the brilliant white grip of the stick (displayed on the website) as I awaited its arrival. I was not only amazed upon actually handling it, I was stunned when I discovered the faux ivory was so realistic that I could actually see an aged, yellowish appearance; but even more so, the detail within the grip reflects the actual, realistic grain of elephant teeth ivory. Others who have examined this walking stick are shocked when they are informed that it is faux ivory, not pure ivory. I could not be more pleased or more proud. Even Bat Masterson would be envious. By the way, the western Emporium faux ivory walking stick accents my ivory gripped pistols!!. 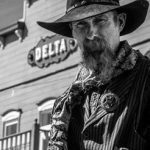 Having become aware of the fashions available through Western Emporium by a gentleman who wore the "authentic cowboy" look in WALMART, I inquired of his attire and, thus, began my journey to upgrade my own wardrobe. I have ordered several vests, shirts, cravats, and the faux ivory walking stick and, upon close examination, found they were flawless in quality and appearance. I especially liked the metal buttons on vests and shirts. Like the person I met at WALMART, I also now "turn heads" as I browse through the aisles. The ladies (though they present a false indiscriminate glance), they notice. Men know that women notice clothes. Wearing these new "authentic cowboy" fashions at restaurants, hotels, and even in public parks strolling with my wife, I have observed that people address me as "Sir" in an honorable fashion (even those of my own age or even older); often adding positive comments to the attire. Although the old proverb states, "Clothes do not make the man," is a true statement regarding what is within a man's heart, I have found that this change in wardrobe has gained a respect from the public as they eagerly seek to honor the "cowboy" of American legend.